This cool kitty is inspired by the Cubist Art Style. 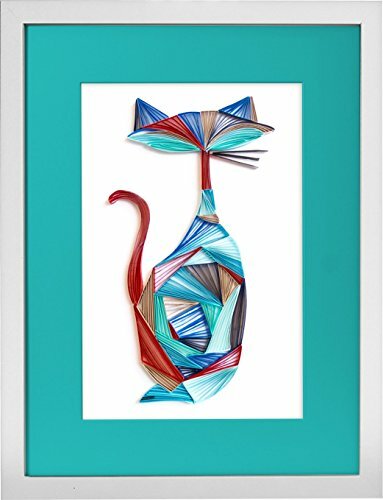 The simplistic form and beautiful hues of blue and accents of red makes this not only the coolest kitty but also extremely adorable! Details and Dimensions Colors: Multiple shades of blue, beige and red accents Handcrafted with high quality acid-free paper strips of 1/4 inch width glued onto a thick white cardstock Comes in ready-to-hang in a in a white deep gallery style frame with a double mat and glass Matt size: 16"x20" opening matted to display 11"x14" art Overall frame size: 18"x22"
If you have any questions about this product by kaagaz, contact us by completing and submitting the form below. If you are looking for a specif part number, please include it with your message.